Chocolate-covered caramels made from rich, smooth dark chocolate filled with soft buttery caramel. Flavors include Fleur de Sel, Caribbean Rum Raisin, Banana Flambe, Tropical Passion Fruit, Italian Espresso, Matcha Green Tea, Dark Chocolate, Brazilian Caipirinha, and Butter Caramel, among other flavors. Allergen Information: Contains traces of peanuts, tree nuts, soy, gluten, and dairy. 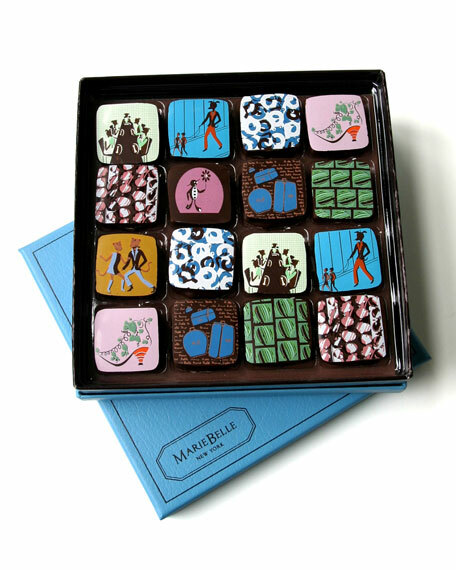 Since 2000, MarieBelle New York has been creating tantalizing chocolates and confections. Named after Maribel Lieberman, the founder and designer, the chocolates are packaged to resemble semiprecious jewels in their display boxes. MarieBelle's chocolates contain no preservatives, are handmade with only the finest single-origin cacao, and are crafted from the freshest, purest, fruit essences and creams.